I haven’t read a single Colleen Hoover book that I didn’t end up loving and/or crying over. All Your Perfects was no different. For a moment I thought I was actually going to make it and not cry. She got me, though. She got me. I see now why she compared All Your Perfects to Ugly Love when she said, “Want to know where the feels fall with this one? I’d say right smack dab in the middle of Ugly Love and It Ends With Us.” My emotions were all over the place and even though I didn’t cry until the end it was a lot of tears. After reading Without Merit, her more recently published book, I must say I much prefer her more adult-themed books. Within the first five pages, I knew I was going to love All Your Perfects. Within the first fifty pages, my heart was already broken. I don’t want to give too much away, but I can definitely see people either loving or hating this one. It required both sympathy and empathy on my part to truly appreciate the story. 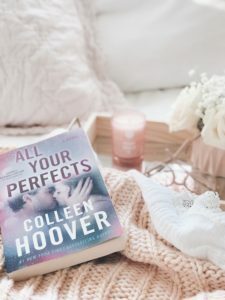 The way Colleen Hoover wrote I was able to feel Quinn’s disappointment, sadness, frustration, and utter devastation at her situation. My heart broke a million times over for her and her husband, Graham. I couldn’t handle how sweet and heartbreaking this book was. One minute I was smiling ear to ear for Quinn and Graham and the next I was full of sadness. All Your Perfects is definitely a book that isn’t black and white. There are major, adult issues that made me angry, made me upset, but also gave me hope for Quinn and Graham. It was one of the most real books I’ve read by Colleen Hoover. It brought forth such a sadness that I felt it down to my soul, but I would read it again. I received a copy of this book in exchange for an honest review. 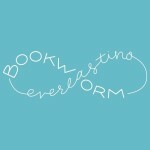 This in no way affects my opinion of the book.